Acrylic Prints are Printed Directly onto the Back of Acrylic Panels. If you’re looking for a truly spectacular image, acrylic prints are an excellent choice. These signs were produced for the Pima County Government. Start with a thick piece of clear acrylic. Next a full color print onto the back of the acrylic! UV inks show off the vivid colors with life-like tones. Once the print is completed, we apply white vinyl for protection and added durability. There are any number of way to apply fastening methods. We also like the idea of relieving the finished product .25 to .50 inches from the wall. Acrylic prints are an exciting way to display your photographs and graphics. 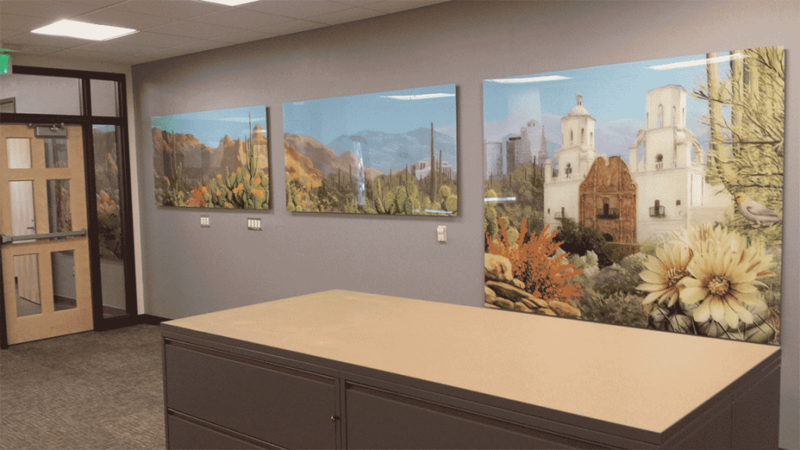 At Graphic Impact, we print any photo directly on to the back of an acrylic sheet. The finish is usually gloss or matte. These acrylic prints can be printed up to 4 feet by 8 feet. The colors from these acrylic print are far more vivid and intense than that produced on other substrates. We also rate the contrast significantly better. These acrylic photographs are frequently found in art galleries, as a center piece in corporate office buildings and photography studios. Lately they have become popular in homes, especially for family photographs. We have found that some interior decorators insist on custom acrylic prints. These can be produced at any size. A major advantage of the process is that the photo is printed directly on to large acrylic panels with a flatbed printer. Normally purchased by consumers, photography studio and corporate centers.